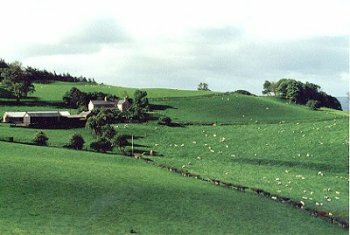 Irregular landscape of small farms on wooded slopes and valleys, just below the moorland, including part of former medieval park. Irregular broken countryside of wooded hill slopes and steep-sided valleys and small isolated flatter areas, varying in height from about 150 to 260m, and largely falling within Clwydian Range AONB. Dispersed farms, generally close to the moorland edge towards the upper margins of the area. 19th- and 20th-century houses expanding eastwards from Llanbedr Dyffryn Clwyd, scattered along the main Ruthin to Mold road and the minor road up to Foel Fenlli, including Castell Gyrn, the prominently-sited stone tower built in the 1970s and 1980s and the Clwyd Gate Inn and Motel, the site of the former toll gate on the eastern edge of the character area. 18th- and 19th-century stone-built farmhouses and cottages, sometimes rendered, with slate roofs, with stone and brick outbuildings. Farmland is predominantly improved or semi-improved grassland laid out in small- to medium-sized, rectangular fields generally set out in relation to contours, probably at least in part representing 18th- and 19th-century enclosure of lower hill land. Field boundaries largely formed of mature low hawthorn hedges, repaired in places with post and wire, with scattered taller ash, oak, hazel and silver birch. Slight field banks and lynchets and grown out hedges on some steeper ground. Some fields have been amalgamated, leaving traces of earlier lynchets. Occasional drystone field, farmyard and garden walls, often in a dilapidated condition, in places where surface stone is more readily available. Occasional stone gateposts. Wooded area along steep-sided stream valleys and small areas of natural oak woodland on lower slopes and rock outcrops, and occasional small modern coniferous plantations, Coed Plas-y-nant and Coed Rhiwisg and Coed Ceunant being classed as either ancient semi-natural woodland or replanted ancient woodland. The area is bisected by the steep-sided valleys which carry the main road between Ruthin and Wrexham (A494), a former turnpike road, cut into the side of the hill, and the minor road from Ruthin to Mold which skirts the foot of Foel Fenlli, running in a deep, partly stone-revetted hollow-way. Some surviving probable 18th- or early 19th-century drystone shale walling and revetments on lower side of the Ruthin to Wrexham turnpike, largely replaced by modern stone and concrete blocks on uphill side. Footpaths include the course of the modern Offa's Dyke path, running north-south, together with a number of footpaths which traverse the Clwydian hills east-west. A number of small hill-top stone quarries of unknown date fall within the character area.